Dana's MLS Stopper Technologies exhibit both plastic and elastic characteristics, making them ideal for sealing applications such as cylinder-head gaskets. This innovation utilizes topography, which creates a highly uniform seal. In areas where significant force is applied around the bolts, the waves compress more than in areas subjected to less force. Highly uniform loading reduces oil consumption, bore distortion, and overhead cam distortion. The Wave-Stopper layer forms concentric sealing rings, which provide additional micro-sealing at the combustion chamber. 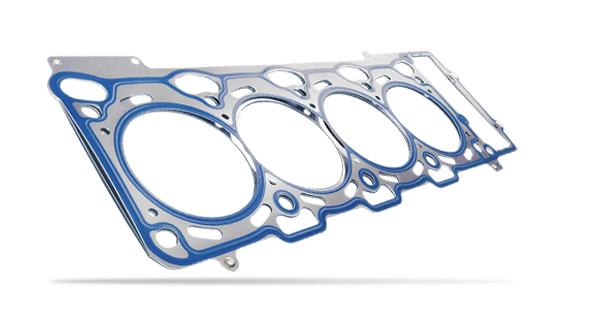 Dana has innovated Semi-Stopper technology to meet the increased sealing requirements of today's cylinder-head gasket joints. Here, a shim of optimized thickness is placed between the full beads of the active layers at the combustion seal to ensure their full compression. This enables the multi-layer steel head gasket to maintain a proper seal, even for applications with extremely high combustion pressures. The Semi-Stopper is well suited for applications with narrow sealing lands since it requires less space compared to other stopper type designs.